While it seems like there’s a new steakhouse popping up in Chicago every few months, and while they’re always pushing new styles and traditions, one constant is that any steakhouse meal has the potential to run up a hefty tab. For those of us not paying with company credit cards, hefty steak prices, a la carte side dishes, and marked-up wine lists can make for a costly night out. However, there are deals to be found if you just know where to look, like these top picks for budget dining options at Chicago's best steakhouses. Seafood towers can be as pricey as they are opulent, but diners at Maple & Ash can order seafood a la carte at reasonable prices. 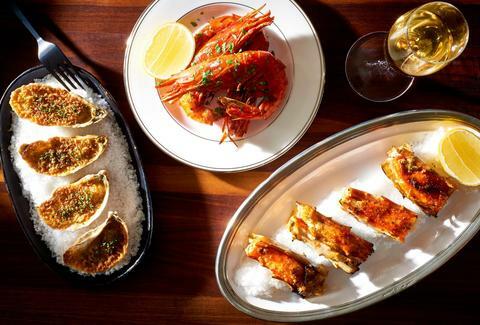 For example, six roasted oysters are $18, 10 Manila clams are $15, and scallops are $22. 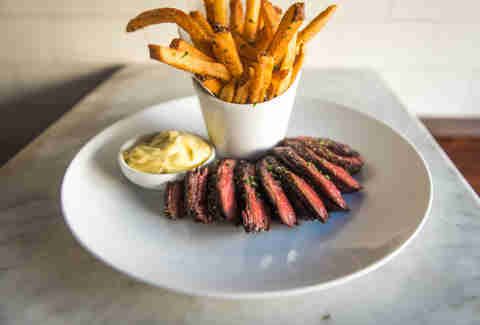 Additionally, if you’re on a budget, but still looking for steak, the restaurant offers a 10oz butcher-cut steak and house-made frites for $28. The bar menu at Eight Bar (formerly known as The Downstairs) is also wallet-friendly. Enjoy David Burke's highly touted dry-aged beef in burger form during lunch hours or at the bar. The $16 40-day dry-aged prime steak Burker is one of the best cheap burgers in Chicago, and uses ground chuck that has been aged in Primehouse’s dry-aging room. The burger comes topped with spinach, caramelized onion, bacon, black pepper aioli, and your choice of cheese, and is served with a generous portion of fries. Carnivores looking for a meat fix can enjoy one of Bavette's signature entrees for a fraction of the cost of the a la carte steaks. Hyped options include short rib stroganoff with handmade egg pasta with sherry jus ($19.50), black label meatloaf with a blend of pork and beef, or a giant dry-aged meatball served with pasta and finely shaved cheese ribbons (both $18.50). 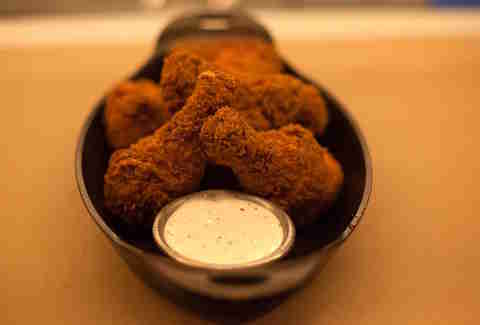 Another worthy option is the fried chicken served with creamy mashed potatoes, and a sweet pea & cippolini gravy ($21.50). The lunch menu at Gibsons is much more affordable than the dinner offerings, with several sandwich options that won’t break the bank. The lobster roll ($21) includes a sizable portion of lobster meat atop a bed of crisp Bibb lettuce, while the prime rib French dip ($17.25), and blackened salmon sandwiches ($15.75) are both reasonable options. 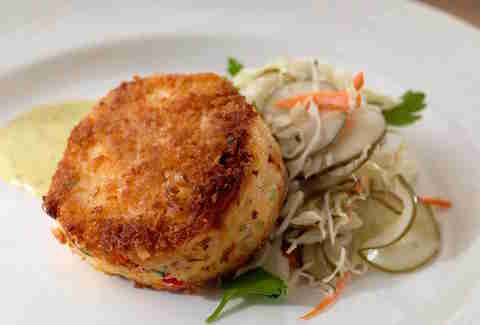 You can also head to sister restaurant Hugo’s Frog Bar & Fish House next door, which serves the same steaks as Gibsons. It offers filet mignon medallions served with sautéed vegetables for $22.75, about half the price of the 10oz filet mignon on the menu, as well as $1 oysters every day from 3-6pm. The Mag Mile steakhouse offers a separate bar menu that includes stone oven-roasted wagyu meatballs ($10), a braised beef flatbread ($14), and, at lunch, a $20 wagyu beef burger topped with special sauce and aged cheddar on a sesame bun. The $23 steak sandwich is large enough to satisfy His Airness himself, and features a pretzel roll stuffed with steak, provolone, pickled onions, and giardiniera aioli. While steaks range from $44 to $99 apiece, more affordable non-steak options include a Slagel Family Farm pork chop with sweet & sour onions for $36. Recently renovated Kinzie Chophouse is celebrating its 25th anniversary this year, and one reason it's stood the test of time is its affordable menu options. It offers a wide variety of bar menu bites and drinks, most priced $12 and under, and on Tuesdays and Thursdays, bar menu items are buy one get one free. The marinated skirt steak sandwich with a chimichurri remoulade, Monterey Jack cheese, and crispy onion rings on garlic buttered ciabatta bread is a great option at $25, as is the pan-seared salmon with mustard cream sauce for $22, and the crab cake sandwich for $13, served with roasted red pepper aioli and sesame field greens. A meal at this stylish River North steakhouse, which often includes a celebrity sighting, can be pretty pricey. However, Chicago Cut does have reasonable meat options, including a $26 skirt steak served with sautéed onions and fries, and a $25 rack of BBQ ribs. You can also make a meal of the $14 prime beef sliders, or $19 crab cake paired with a soup, salad, or family-sized side dish. Pretty much everything is over the top here, in a good way, but that doesn’t mean you need to feel like you’re spending more than you can afford. Lunch at RPM Steak is much more cost-effective than dinner, especially when considering some of the steak options. A 6oz petite filet is only offered at lunch, and for $29, it’s more affordable than many competitors’ same-sized filets. The black truffle burger with foie gras butter and red onion jam not only tastes rich, but checks in at a reasonable $17. Another suitable option is the $18 King Crab Louie seafood salad, or the lobster roll with lemon butter on brioche, for the same price. Another spot that offers a more affordable price point at lunch, as well as different items than those served at dinner, is Humboldt Park’s Boeufhaus. 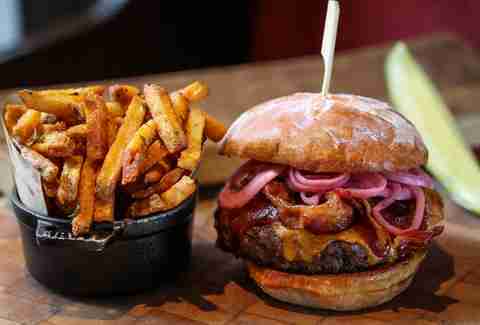 The haus burger is a perfect, albeit filling, lunch option featuring a custom blend of strip, hanger, and tenderloin cuts, topped with frisee, onion, pickle, and a side of the decadent boeuf fat fries for $14. The 8oz hanger steak frites are served with a side of béarnaise for $24 at lunch, a discount from the $28 price tag during dinner hours. Community Tavern, the French-inspired boutique steakhouse in Portage Park, has some great value options for diners still looking for a steakhouse vibe. The $23 steak & frites combo served with homemade steak sauce is one of the most affordable we’ve seen. Non-steak options that won’t leave you penniless include a healthy portion of steamed Maine mussels prepared with brie, Champagne, thyme, crawfish butter, fresh jalapeño, and grilled bread for only $12. Other lower-priced entrees include the pan-seared gnudi with English peas, charred tomatoes, swiss chard, pecorino, red chili oil, brown butter, and pickled mushrooms for $17, and the half roasted Millers Farm chicken with wild mushroom ragu, preserved lemon sofrito, and egg noodles for $18. Amanda Topper is a contributing writer for Thrillist Chicago, food service industry analyst, and food blogger for TheGhostGuest.com. She doesn’t trust anyone who orders their steak well done. Follow her at @AmandaTopper.